When my parents were here, we took them to a sugar bush where maple sap is collected and syrup is made. 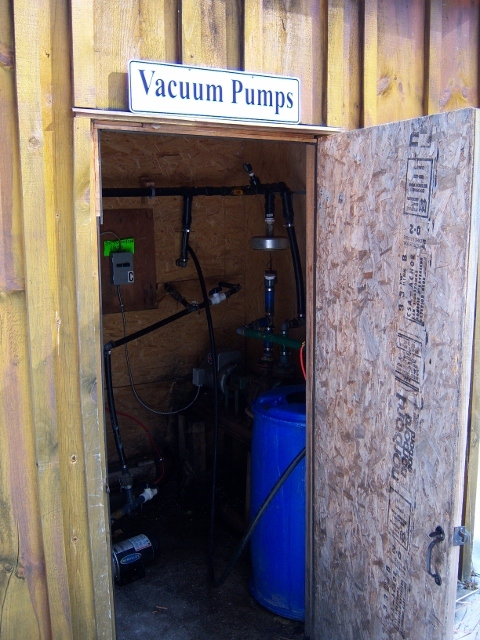 This is a modern operation, full of pipes, vacuum pumps, test plots, and interesting innovations. 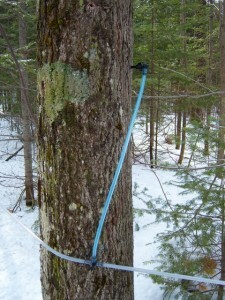 Of course, the traditional way of collecting sap is also interesting. This is how they used to do it. Rather than sending the sap in closed pipes to a stainles steel vat, jolly fellows called Kettle Boys take it from the pails and boil it over open fires in large cauldrons. 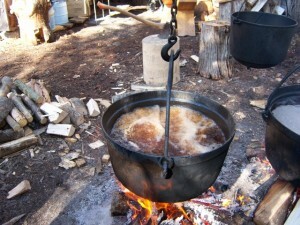 When the sap becomes more syrupy, it boils vigorously and can suddenly bubble over. To prevent this, the Kettle Boys ladle sap from another cauldron and pour it in to cool and dilute the syrup. 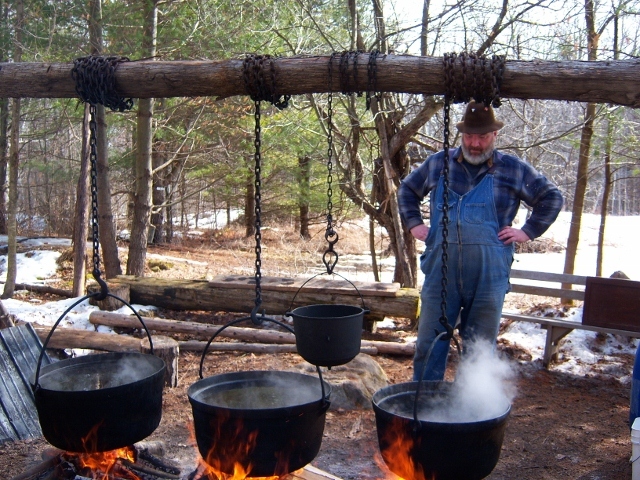 Watching the sap boil into syrup takes constant attention. The syrup has a delightful taste. Apparently it takes on the flavor of the wood smoke as well, but we couldn’t tell. We each got a sample of this syrup, as well as of the syrup made the modern way. Both were delicious. 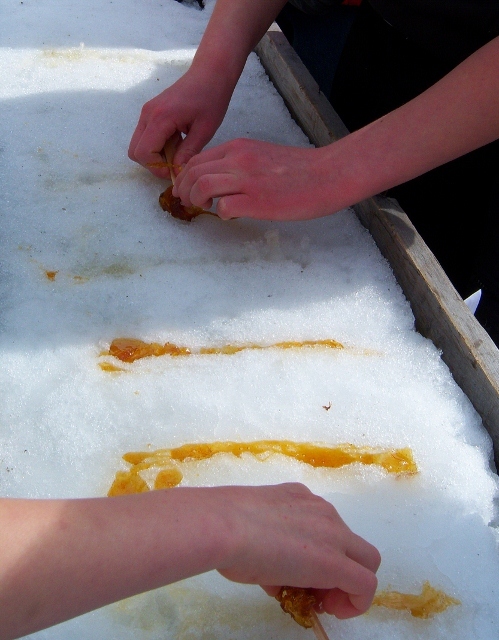 We also rolled up some maple taffy with popsicle sticks from the snow on which it was cooling. It was soft and chewy and full of the most delicious maple flavor. The next day we ate pancakes with maple syrup for breakfast. Yum! 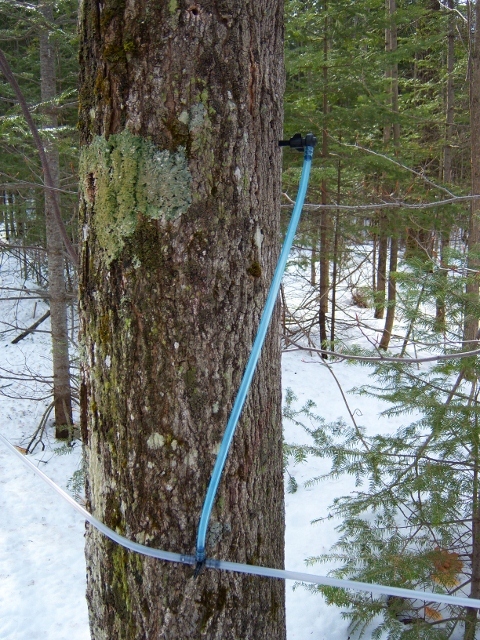 An interpreted walk through various stands of trees and test plots. Hilarious discussions with the Kettle Boys. A unique display of creative wooden toys. And a chance to try out the stocks. I don’t know why they were on display, but the kids enjoyed them. 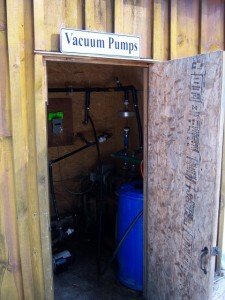 We visited Fortune Farms, one of many maple syrup farms in Eastern Ontario. This post is part of The Homeschool Carnival, Hip Homeschool Hop, and Finer Things Friday. Posted in: God's Wonderful World, Nature Study, Outings, Simple Joys. Yes, it was both fun and yummy! OK, so now I know! Thanks! 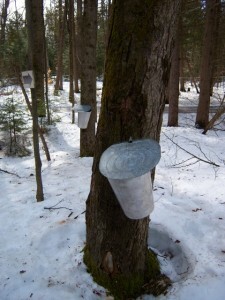 I did not know that about maple syrup. We recently made the switch from icky fake syrup to the real thing. Delicious! Yes, the real thing is much better, isn’t it? Now you’ll know where that delicious taste comes from!